NepalBuzz Pro currently has 24 widgetized (Sidebar) areas that are 1. Primary Sidebar, 2. Secondary Sidebar, 3. Before Footer, 4. Footer Area 1, 5. Footer Area 2, 6. Footer Area 3, 7. Footer Area 4, 8. Header Bottom, 9. Before Content, 10. After Content, 11. Before Posts/Pages, 12. After Posts/Pages, 13. Featured Widget Content, 14. Promotion Headline Left, 15. Promotion Headline Right, 16. 404 Page Not Found Content, 17. 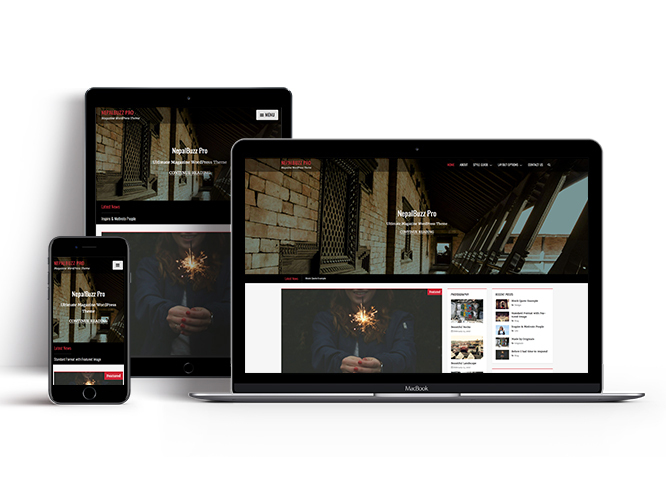 WooCommerce Primary Sidebar, 18. Optional Homepage Sidebar, 19.Optional Archive Sidebar, 20. Optional Page Sidebar, 21. Optional Post Sidebar, 22. Optional Sidebar One, 23. Optional Sidebar Two and 24. Optional Sidebar Three "Appearance => Widgets" or "Appearance => Customize => Widgets" in WordPress. 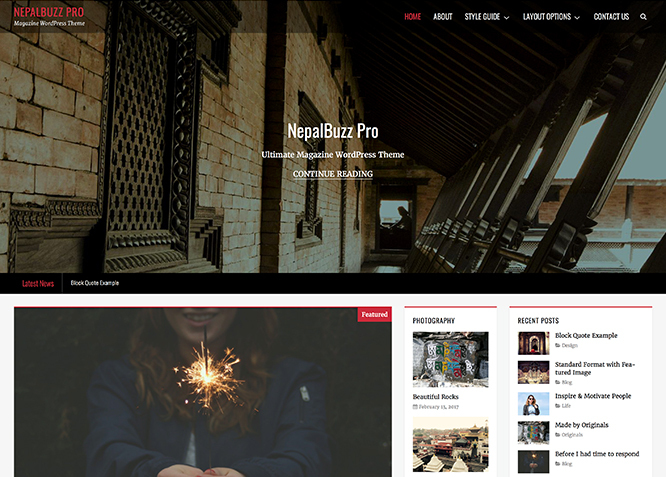 NepalBuzz Pro offers exciting Menu Options! This theme supports and recommends using "Custom Menus". 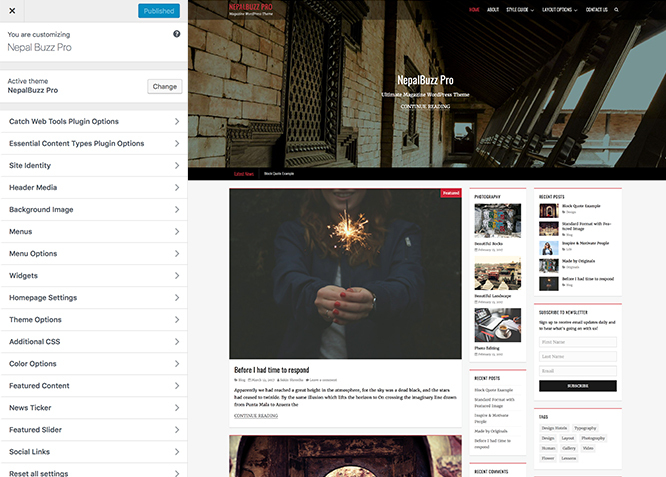 You can create Custom Menu through "Appearance => Menus" from your WordPress Dashboard. #How to Change and Enable Custom Header Image? Go to "Appearance => Customize => Header Media => Header Image"
Now, select enable options in "Enable Header Media on"
Note: If you want to change Header Image Size on Page/Post, choose option below "Page/Post Featured Header Image Size"
NepalBuzz Pro has 7 Default Layout options, 7 Woocommerce Layout options, 4 Archive Content Layout options and various Single Page/Post image layout to choose from "Appearance => Customize => Theme Options => Layout Options"
Once you are in Layout Options, you can Check the box below "Default Layout Options" which will set our site layout. Further, you have the choice of selecting custom layout for individual pages and posts through "NepalBuzz Options => Layout Options", which you shall find below individual posts and pages, when you click on them for adding/editing. Once you are in Layout Options, you can Check the box below "Single Page/Post Image Layout" which will set our posts/page image layout. Further, you have the choice of selecting Single Page/Post Image Layout for individual pages and posts through "NepalBuzz Options => Single Page/Post Image Layout", which you shall find below individual posts and pages, when you click on them for adding/editing. You select required option under "Default"
You can make the required changes by clicking on options under "Select Sidebar"
You can select option "Enable or Disbale"
#How to Disable Single Post Navigation? Go to "Appearance => Customize => Theme Options => Single Post Navigation"
Click on "Check to disable Single Post Navigation"
NepalBuzz Pro has various you can change the color in various elements in the site through Color Picker options categorized in section such as Basic Colors, Header Colors, Header Bottom Widget Area Colors, Content Colors, Sidebar Colors, Pagination Colors, Footer Colors, Footer Widget Area Colors, Promotion Headline Colors, Scrollup Colors, News Ticker Colors, Featured Slider Colors, Feautured Content Colors, Primary Menu Colors, Primary Mobile Menu Colors, Secondary Menu Colors, Secondary Mobile Menu Colors and Footer Menu Colors. To change the colors, go to "Appearance => Customize => Color Options", then select Color Scheme, change individual colors and then click on "Save & Publish"
NepalBuzz Pro supports 5 featured content types, they are: 1. Widget, 2. Post, 3. Page, 4. Category and 5. Custom. For Featured Content Options, go to "Appearance => Customize => Featured Content". Under "Select Content Type", you need to select "Post"
Under "Select Content Type", you need to select "Page"
Under "Select Content Type", you need to select "Category"
Note: When you select categories, make sure your Posts in those categories have Featured ImageClick here to watch our Video Screencast to add Featured Image. Under "Select Content Type", you need to select "Image"
Under "Select Content Type", you need to select "Widget"
Click on "Save & Publish"
Under "Select Featured Content Layout", you can select your desired layout from "2 columns, 3 columns" or "4 columns"
NepalBuzz Pro supports 4 news ticker types. They are: 1. Post, 2. Page , 3. Category and 4. Custom Text News Ticker. For News Ticker, go to "Appearance => Customize => News Ticker". To enable news ticker, select "Homepage/Frontpage or Entire Site" option under "Enable News Ticker on"
Under "Select Ticker Type", Select Ticker Type as "Post News Ticker"
Under "Select Ticker Type", Select Ticker Type as "Page News Ticker"
Under "Select Ticker Type", Select Ticker Type as "Category News Ticker"
Under "Select Ticker Type", Select Ticker Type as "Custom Text News Ticker"
Under Post 1, Post 2 and so on, add the desired "Post Id"
Under Page 1, Page 2 and so on, add the desired "Page"
Under News Ticker #1, News Ticker #2 and so on, add the "Link" and "Title"
To enable ticker, select "Homepage/Frontpage or Entire Site" option under "Enable News Ticker on"
Under "News Ticker Position", Select position as "Below Menu or Above Content"
Under "Select Slider Type", Select Slider Type as "Featured Page Slider, Featured Page Slider, Featured Category Slider or Featured Image Slider"
Under "Select Slider Type", Select Slider Type as "Image"
Under "Select Slider Type", Select Slider Type as "Post"
Under "Select Slider Type", Select Slider Type as "Page"
Under "Select Slider Type", Select Slider Type as "Category"
Check option, "Check to exclude Slider post from Homepage posts"
Under "Featured Post #1, Featured Post #2, Featured Post #3 and so on", add desired "Post Id"
Note: Featured Image Slider is determined according to Number of Slides. NepalBuzz Pro has custom social icons for various social networking sites. You can activate the social icons you want by adding in your social profile links through "Appearance => Customize => Social Links => Social Links", in your WordPress Dashboard.Further, you can add your own custom social image, title, links through "Appearance => Customize => Social Links => Custom Social Links", in your WordPress Dashboard. Note:Featured Posts works as Recent Post as well. #How to add "Image and Menu Widget" in widget area(CT: Image and Menu Widget)? This widget adds an image and a menu. It can be use for branding in sidebar. #How to add "Tabbed Featured Posts" in widget area(CT:Tabbed Featured Posts)? You can see "Tab 1" and "Tab 2" option and desired title for Tabs under "Title" also under the respective field. Updated: Tabbed Featured Posts Widget default title changed from "Recent Post" to "Recent Posts"